There are two common types of amnesia: anterograde amnesia and retrograde amnesia ([link]). Anterograde amnesia is commonly caused by brain trauma, such as a blow to the head. With anterograde amnesia, you cannot remember new information, although you can remember information and events that happened prior to your injury. The hippocampus is usually affected (McLeod, 2011). This suggests that damage to the brain has resulted in the inability to transfer information from short-term to long-term memory; that is, the inability to consolidate memories. Retrograde amnesia is loss of memory for events that occurred prior to the trauma. People with retrograde amnesia cannot remember some or even all of their past. They have difficulty remembering episodic memories. What if you woke up in the hospital one day and there were people surrounding your bed claiming to be your spouse, your children, and your parents? The trouble is you don’t recognize any of them. You were in a car accident, suffered a head injury, and now have retrograde amnesia. You don’t remember anything about your life prior to waking up in the hospital. This may sound like the stuff of Hollywood movies, and Hollywood has been fascinated with the amnesia plot for nearly a century, going all the way back to the film Garden of Lies from 1915 to more recent movies such as the Jason Bourne spy thrillers. However, for real-life sufferers of retrograde amnesia, like former NFL football player Scott Bolzan, the story is not a Hollywood movie. Bolzan fell, hit his head, and deleted 46 years of his life in an instant. He is now living with one of the most extreme cases of retrograde amnesia on record. View the video story profiling Scott Bolzan’s amnesia and his attempts to get his life back. When someone witnesses a crime, that person’s memory of the details of the crime is very important in catching the suspect. Because memory is so fragile, witnesses can be easily (and often accidentally) misled due to the problem of suggestibility. Suggestibility describes the effects of misinformation from external sources that leads to the creation of false memories. In the fall of 2002, a sniper in the DC area shot people at a gas station, leaving Home Depot, and walking down the street. These attacks went on in a variety of places for over three weeks and resulted in the deaths of ten people. During this time, as you can imagine, people were terrified to leave their homes, go shopping, or even walk through their neighborhoods. Police officers and the FBI worked frantically to solve the crimes, and a tip hotline was set up. Law enforcement received over 140,000 tips, which resulted in approximately 35,000 possible suspects (Newseum, n.d.). Even though memory and the process of reconstruction can be fragile, police officers, prosecutors, and the courts often rely on eyewitness identification and testimony in the prosecution of criminals. 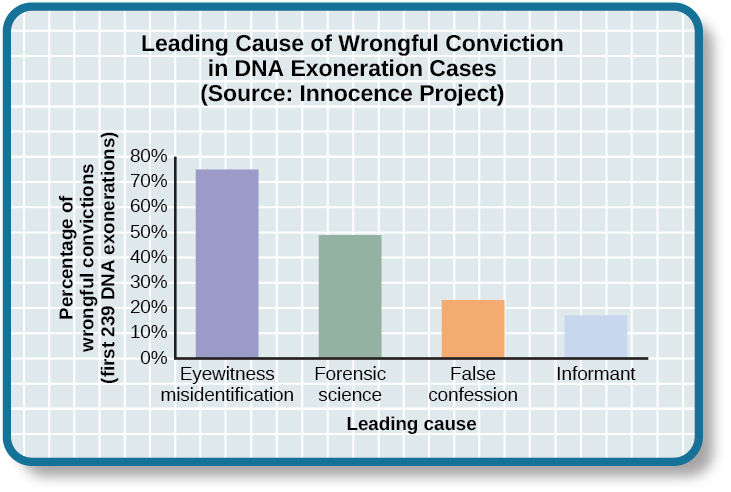 However, faulty eyewitness identification and testimony can lead to wrongful convictions ([link]). To learn more about Ronald Cotton and the fallibility of memory, watch these excellent Part 1 and Part 2 videos by 60 Minutes. According to Loftus, an eyewitness’s memory of an event is very flexible due to the misinformation effect. To test this theory, Loftus and John Palmer (1974) asked 45 U.S. college students to estimate the speed of cars using different forms of questions ([link]). The participants were shown films of car accidents and were asked to play the role of the eyewitness and describe what happened. They were asked, “About how fast were the cars going when they (smashed, collided, bumped, hit, contacted) each other?” The participants estimated the speed of the cars based on the verb used. Psychologist Daniel Schacter (2001), a well-known memory researcher, offers seven ways our memories fail us. He calls them the seven sins of memory and categorizes them into three groups: forgetting, distortion, and intrusion ([link]). In 1885, German psychologist Hermann Ebbinghaus analyzed the process of memorization. First, he memorized lists of nonsense syllables. Then he measured how much he learned (retained) when he attempted to relearn each list. He tested himself over different periods of time from 20 minutes later to 30 days later. The result is his famous forgetting curve ([link]). 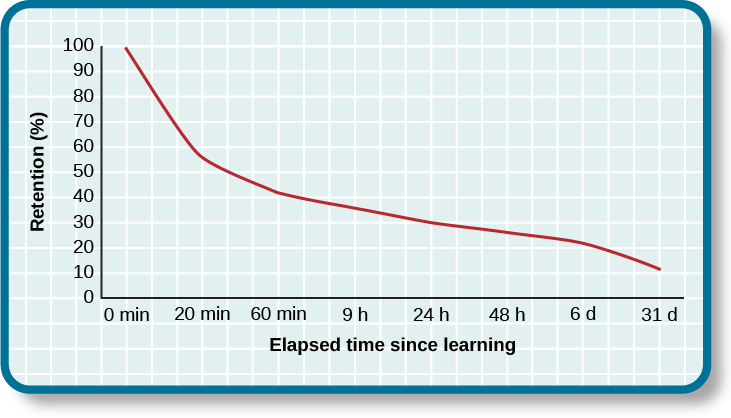 Due to storage decay, an average person will lose 50% of the memorized information after 20 minutes and 70% of the information after 24 hours (Ebbinghaus, 1885/1964). Your memory for new information decays quickly and then eventually levels out. “I just went and saw this movie called Oblivion, and it had that famous actor in it. Oh, what’s his name? 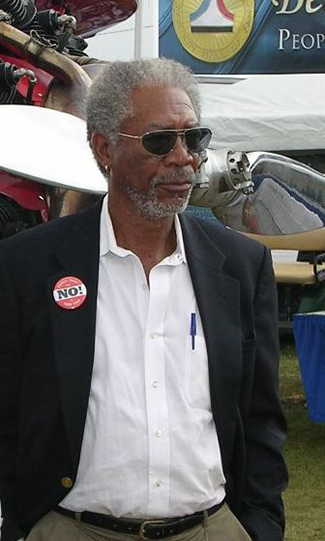 He’s been in all of those movies, like The Shawshank Redemption and The Dark Knight trilogy. I think he’s even won an Oscar. Oh gosh, I can picture his face in my mind, and hear his distinctive voice, but I just can’t think of his name! This is going to bug me until I can remember it!” This particular error can be so frustrating because you have the information right on the tip of your tongue. Have you ever experienced this? If so, you’ve committed the error known as blocking: you can’t access stored information ([link]). Have you ever had a song play over and over in your head? How about a memory of a traumatic event, something you really do not want to think about? When you keep remembering something, to the point where you can’t “get it out of your head” and it interferes with your ability to concentrate on other things, it is called persistence. It’s Schacter’s seventh and last memory error. It’s actually a failure of our memory system because we involuntarily recall unwanted memories, particularly unpleasant ones ([link]). For instance, you witness a horrific car accident on the way to work one morning, and you can’t concentrate on work because you keep remembering the scene. Sometimes information is stored in our memory, but for some reason it is inaccessible. This is known as interference, and there are two types: proactive interference and retroactive interference ([link]). Have you ever gotten a new phone number or moved to a new address, but right after you tell people the old (and wrong) phone number or address? When the new year starts, do you find you accidentally write the previous year? These are examples of proactive interference: when old information hinders the recall of newly learned information. Retroactive interference happens when information learned more recently hinders the recall of older information. For example, this week you are studying about Freud’s Psychoanalytic Theory. Next week you study the humanistic perspective of Maslow and Rogers. Thereafter, you have trouble remembering Freud’s Psychosexual Stages of Development because you can only remember Maslow’s Hierarchy of Needs. All of us at times have felt dismayed, frustrated, and even embarrassed when our memories have failed us. Our memory is flexible and prone to many errors, which is why eyewitness testimony has been found to be largely unreliable. There are several reasons why forgetting occurs. In cases of brain trauma or disease, forgetting may be due to amnesia. Another reason we forget is due to encoding failure. We can’t remember something if we never stored it in our memory in the first place. Schacter presents seven memory errors that also contribute to forgetting. Sometimes, information is actually stored in our memory, but we cannot access it due to interference. Proactive interference happens when old information hinders the recall of newly learned information. Retroactive interference happens when information learned more recently hinders the recall of older information. ________ is when our recollections of the past are done in a self-enhancing manner. 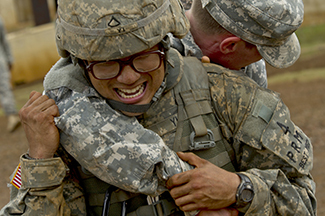 Tip-of-the-tongue phenomenon is also known as ________. Compare and contrast the two types of interference. There are two types of interference: retroactive and proactive. Both are types of forgetting caused by a failure to retrieve information. With retroactive interference, new information hinders the ability to recall older information. With proactive interference, it’s the opposite: old information hinders the recall of newly learned information. Compare and contrast the two types of amnesia. There are two types of amnesia: retrograde and anterograde. Both involve the loss of long-term memory that occurs as the result of disease, physical trauma, or psychological trauma. With anterograde amnesia, you cannot remember new information; however, you can remember information and events that happened prior to your injury. Retrograde amnesia is the exact opposite: you experience loss of memory for events that occurred before the trauma. Which of the seven memory errors presented by Schacter have you committed? Provide an example of each one. Jurors place a lot of weight on eyewitness testimony. Imagine you are an attorney representing a defendant who is accused of robbing a convenience store. Several eyewitnesses have been called to testify against your client. What would you tell the jurors about the reliability of eyewitness testimony? Problems with Memory by OpenStaxCollege is licensed under a Creative Commons Attribution 4.0 International License, except where otherwise noted.